Located in central British Columbia, the Cariboo, Chilcotin, Coast region makes up the Wild West Country. The region stretches through a range of spectacular snow peaked mountains to the Great Bear Rainforest on the Pacific coast. It is home to forests, lakes, rivers, mountains, ice fields and the flat plains/grasslands of the Chilcotin Plateau, as well as BC’s largest provincial park. With its rich history and proximity to the wilderness, this Wild West has something for everyone. As of 2015, there are nearly 300 tourism businesses and establishments in region, employing nearly 2000 full-time employees. 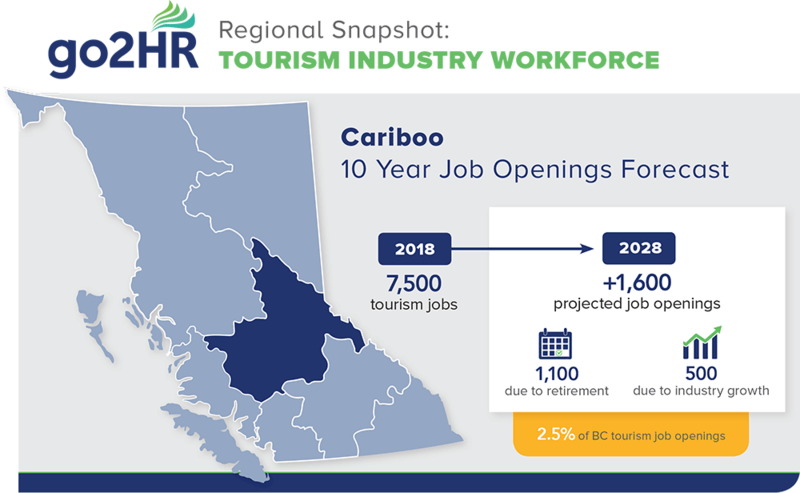 The Cariboo Chilcotin Coast region comprises a large number of seasonal businesses, which prevents you from offering year-round, full-time opportunities to stellar employees. It’s also challenging for you to entice seasonal workers to return year after year. Where are you going to find workers to fill your openings? Do you have the resources, structure or tools to implement an effective human resource program that can engage employees in the long run? Explore a myriad of tips and articles that will help you attract qualified candidates and keep current employees happy and satisfied. Employee training and development has a direct impact on improving customer service, productivity, consistency, staff morale, and sales. Investing in staff training is also a way to keep the superstar employees, making sure they are equipped with the right skill sets, certification and training for their positions. Given the breadth of the industry, education requirements vary greatly, but many entry-level positions in the tourism industry do not require formal education or a degree. Serving It Right: BC’s mandatory self-study program for the responsible service of alcohol. Special Event Server: BC’s responsible beverage service program for serving alcohol at special events. FOODSAFE: Required for foodservice workers to learn about the dangers and prevention of food poisoning. This course is available online, by distance education or in a classroom setting. We offer the distance education version of FOODSAFE Level 1. SuperHost: customer service training for front-line staff. Whether you are a large or small business, a strong commitment to safety sets you apart as an employer of choice and inspires confidence from your current and future employees. Participation in the Certificate of Recognition (COR) Program – an occupational health and safety audit and certification program – offers many benefits, including financial incentives from WorkSafeBC, improvement on employee morale and productivity, thus building a positive corporate image. Small employers with fewer than 20 employees can participate in the Small Employers COR (SECOR) program, which has a slightly different process and audit tool that takes into account the size of the operation in order to increase small employers’ success. To get started, check out the Resource Library to download customizable tools and checklists for your health & safety program. If you have any questions, reach out to your regional Industry Health and Safety Specialist, Stephanie Mallalieu, who can provide you with one-on-one assistance in your program. Contact Stephanie at smallalieu@go2hr.ca or call 604-633-9787 ext. 220. Welcome guests to a tranquil west coast wellness spa. Develop lasting friendships working at a remote wilderness resort surrounded by vast peaked mountains and deep canyons. Bring history to life by acting out stories from the Cariboo Gold Rush. Lead backcountry tours by boat, horse or foot, where glaciers descend to azure-blue lakes and grasslands are dominated by wild horses. Crash through angry rapids while hosting an eco-rafting tour. Leave the bustling city and relax in a region known for its laidback lifestyle. Mother Nature is your playground. You can hike, kayak, horse ride, bike, and play in Canada’s Wild West where you will explore canyons, mountain peaks, glaciers, volcanos, rainforests, hot springs, grass lands, and observe an abundance of wildlife. Are you trying to connect with a local tourism company in the Cariboo, Chilcotin, Coast? Here is a snapshot of tourism companies currently registered on our website. In our Tourism Company Directory, you may also find local chambers of commerce, regional destination marketing organizations and tourism sector associations in your area.